It takes a bit of chutzpah to love the hell out of a bakery, gush and gush about its perfect croissants and chocolate rye cookies and baguettes and the rest, pick a hotel based purely on its proximity to said bakery, buy the baker's cookbooks, and then go doubt one of its recipes. But I couldn't help myself: I love pretty much everything about Chad Robertson's Tartine Bakery, and I bake my weekly loaf from his book, Tartine Bread, but I saw a recipe in there for semolina bread, and I'll confess it: I didn't believe it would work. How does cream of wheat become a loaf of bread with barely any regular flour in the mix? Seemed a bit like making bread entirely out of oats. I envisioned a wet, tacky blob with no crumb. I actually convinced myself that even though Chad Robertson considered this bread good enough to publish in his award-winning book, I wouldn't be able to get semolina dough to rise. Arrogant, much? Fortunately, I threw caution to the wind. Obviously, I was dead-wrong in my doubts. What emerged from the oven last Friday was one of the best loaves I've ever made. The bread was supple, guys. It had a beautiful crumb - tightly aerated, consistent. The flavor was sweet, and also sort of mysterious from the fennel and sesame Robertson has you grind up and incorporate into the loaf. The raisins give each slice little moments of sweetness. This bread? It was a total winner. Let's talk about how to use it. First: toasted, smeared with good salted butter. You must. Also, have a slice with more salted butter and some marmalade. It's an Amanda Hesser that could not find a better home. Now then. It may sound like a strange combination, but I made a ridiculously tasty tartine (ha) with slices of this bread, a nice thick layer of fresh goat cheese, very timid application of harissa, a pile of simply-roasted cauliflower, and a squeeze of lemon. Really, I want to eat it every day. And now, I'm thinking of making a roasted cauliflower recipe inspired by the bread: fennel and sesame seeds, raisins, olive oil, bread crumbs. YES. I also made a lovely chickpea-fennel stew the other night which we loved ladled over this bread. The stew was heavy on the tomatoes and chilies, and had I thought for another second, I might even have added golden raisins to the mix. Fortunately, the raisins in the bread came through. The point is that this bread goes with so much more than you might think. So give it a whirl, why don't you. That's what weekends are for. A few disclaimers. First, this is a sourdough bread. It starts with a leaven, made by combining a bit of mature starter with equal parts flour and water. That said, you can make this bread without sourdough by adding a bit of yeast. Both ingredient lists are below. The sourdough recipe calls for a larger leaven, because what you don't use in the bread will become your new starter. Second, this is not a quick bread recipe. Candidly, it takes forever. That said, it really is quite flexible. If you miss a fold or let the dough rise too long, don't worry about it. I've tried every permutation of mistake, and I've never made a bad loaf of bread using this template. Finally, consider yourself warned: you need to start this bread the night before you bake it. In a medium mixing bowl, combine water and starter or yeast. Add flour, and use a fork to mix until no dry spots remain. Cover with a kitchen towel and set aside in a draft-free area overnight. Make the dough: In a large bowl, combine 375 grams water with 100 grams of leaven. Stir to break up the leaven in the water. Add the semolina and regular flour, and stir using a fork or your hands until no dry bits remain. Let the dough rest in the bowl, covered loosely with a towel, for 40 minutes. While the dough is resting, toast the tablespoons of fennel and sesame seeds in a dry skillet over medium-high heat for 3-5 minutes, until golden and fragrant. Transfer to a small bowl to cool. Then grind the seeds in a spice grinder until powdery. Soak the raisins in warm water for 30 minutes. Drain, then add ground seeds and orange zest. After the resting period, add the salt and the remaining 25 grams of warm water. squeeze the dough between your fingers to incorporate the salt and extra water; it will break apart a bit, but then start to reform as you work it. Turn your oven on to its lowest setting and let it preheat for about 3 minutes, just until slightly warmer than room temperature. Then turn off. Transfer the dough to a heavy container. Robertson prefers a clear one, so you can see the rise happen from the side. I've used both clear and opaque - your choice. Either way, cover with a wood cutting board, a pizza stone, or something else that's heavy and safe to put in a warm oven. You can also just wrap it in a kitchen towel, which I often do. The wood cover helps keep the dough insulated and warm. Either way, cover your dough and transfer to the warm oven to rise. To turn the dough, you'll reach into the rising container, grab the underside of the dough, and stretch it up, out, and over itself. Then you'll repeat that motion with the other 3 "sides" of the dough. Each turn is really 4 stretch-and-turn motions. After the second turn, incorporate the raisin-spice mixture by pouring it into the dough and folding/mixing it in with your hands. No need to be gentle - your dough isn't delicate enough that you could wreck it. Just get the goodies in there. At 30 minutes, do a turn, recover the dough, and put it back in the oven. Repeat every 30 minutes for the first 2 hours. By the start of the 3rd hour, the dough should have grown a bit more aerated and light. By the end of hour 3 or somewhere into hour 4, it should look even a little billowy. The volume should have increased 30%. That's when you know it's ready for shaping. Between you and me, on extra-cold days, the dough doesn't really get billowy. That's okay. At the 4 hour mark, I'll shape it anyway, and just give it a bit longer to rise before baking. Shape the dough: When your dough is ready for shaping, pour it onto a lightly floured work surface. Then use a bench scraper to fold the dough onto itself, so the entire surface of the dough is dusted with flour. You'll now do the initial shaping. Using your bench scraper in your dominant hand, start to tuck the dough under itself, turning the dough as you go, so the surface grows increasingly taut and internal tension ("spring") develops. Don't overdo it - you'll have another shot to build internal tension during the final shaping. Cover with a kitchen towel and let rest for 20-30 minutes. If, after this initial shaping, the dough starts to look like a total pancake, instead of a fat, rounded blob, repeat the initial shaping and rest a second time. This ensures that your bread won't look like a pancake when it comes out of the oven. Now, you're ready for the final shaping. The final shaping is a series of folds, similar to the turns you completed in the bowl. To do them, turn your dough seam-side up (upside down). Fold the "side" of the dough closest to you up and over the middle. Then stretch the dough horizontally to your right, and fold that side over the middle. Stretch the dough to the left, and fold that side over the middle. Finally, stretch the far side of the dough, and fold it over all the other folds, then tuck it under as you turn the dough back onto its top. This last fold anchors the dough and ensures good internal tension, which should give you a nice, high loaf. Cup your hands around the dough and roll your hands from top to bottom, to get a smooth, round top. Then, line a basket or bowl with a non-terrycloth towel (linen works great), sprinkle generously with flour or a mixture of rice and regular flour, and tuck the dough into its rising bowl, seam-side up. At this point, the dough can rise for anywhere between 2 hours (in a warm, draft-free spot) and 5 hours (if your rising area is cool and drafty). The bread is much more flexible than you might think - mine rose for 7 hours yesterday, and it turned out great - so don't fret. 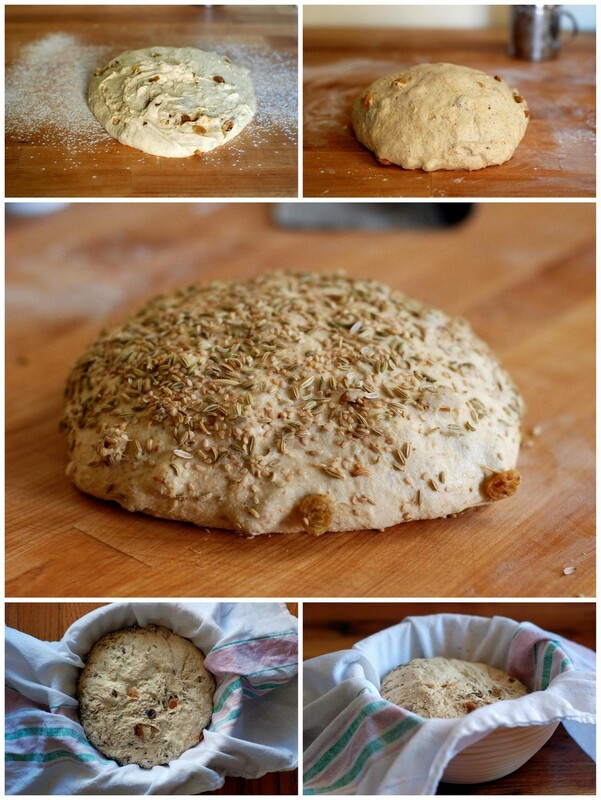 Bake the bread: Preheat the oven to 500° F. Put a dutch oven or other heavy, covered pot into the oven to preheat. When oven has been preheating for at least 30 minutes, remove the dutch oven (carefully!) and turn the dough into the dutch oven. A couple tips: wear oven mitts. Don't fret if your dough doesn't turn in evenly - happens to me all the time. Cover your pot, return to the oven, and immediately reduce the temperature to 450°. Bake for 20 minutes. Then uncover and bake for 20-25 minutes more, until very brown and very crusty. Remove from the oven and let cool for at least 10 minutes before eating, if you can resist.